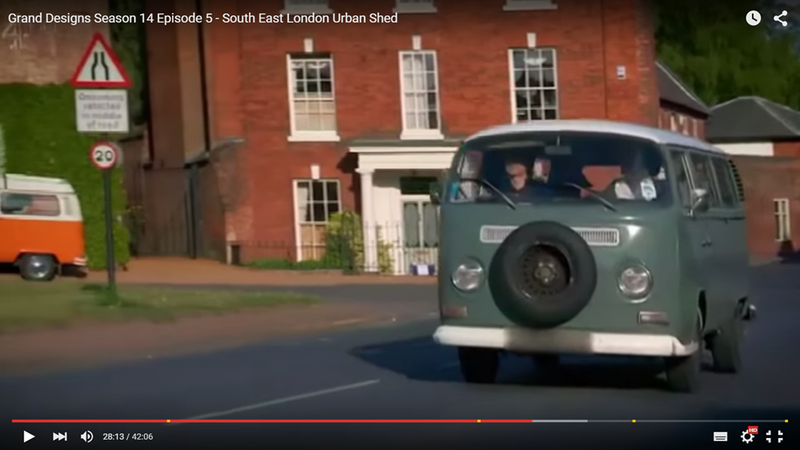 Best of both worlds: Cool house building project and an Early Bay Window VW bus popping up in the middle of this Grand Designs episode (Season 14 Episode 5 London). Over the last couple of years we have fallen deeply in love with Kevin McCloud and his Grand Designs. 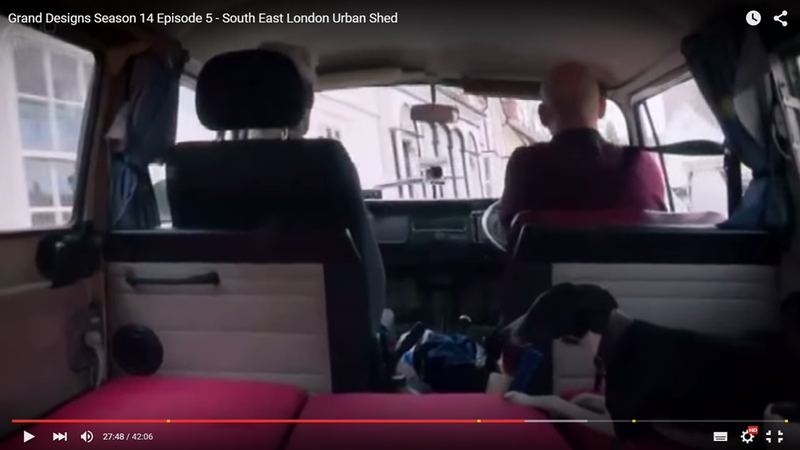 Cool artist couple in this episode with a good taste in cars: Nice surprise to see their early bay window around minute 28 (and another late bay popping up in the backround). Louvered window on one side and perhaps some campervan conversion/bed construction going on in the back where the doggy travels behind the driver. Walk way to the back looks a lot like Taiga Lily’s, with air out lets on both sides of the walls behind the front seats, but a handle only on the sliding door side. Passenger seat not original but safer (with a head rest), driver seat more original but without. I stumbled over this movie on the flight back from Australia in May: „Rush“ is about the rivalry between the Formula One drivers Niki Lauda and James Hunt in the early and mid-seventies, culminating in Niki Lauda’s gruesome accident at the Nürburgring in 1976, and his come back after that. Most of my life I knew Niki Lauda only from his post-F1 times, as founder of an airline and pilot himself, and later as a F1 commentator. In that year of 1976, I proudly started primary school in August, and our bus Taiga Lily was born in May. 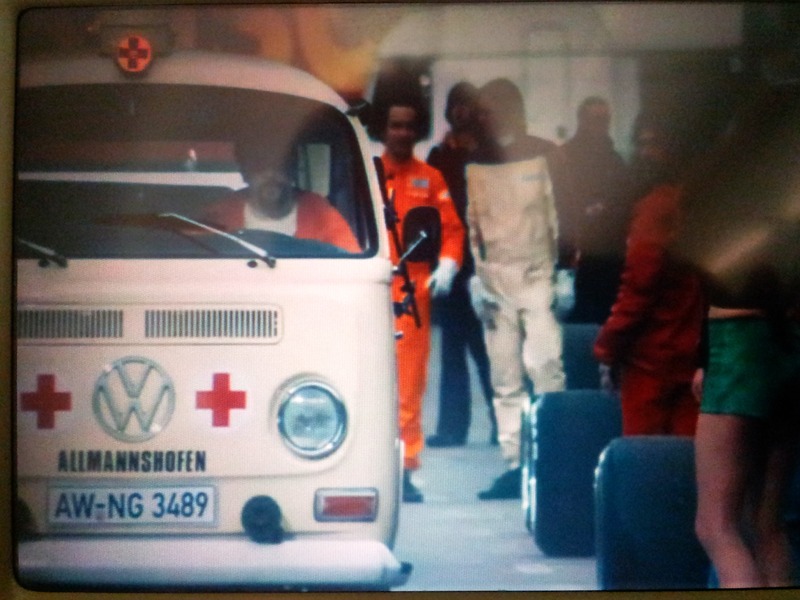 The movie is actually pretty exciting, and the mini appearance of an early bay ambulance towards the end also made the kombi spotter happy. Looks like they got this detail quite right – the bus looks a lot like the real Red Cross kombi I saw last year in Berlin. The last of its kind, still in use at the Berlin Red Cross. 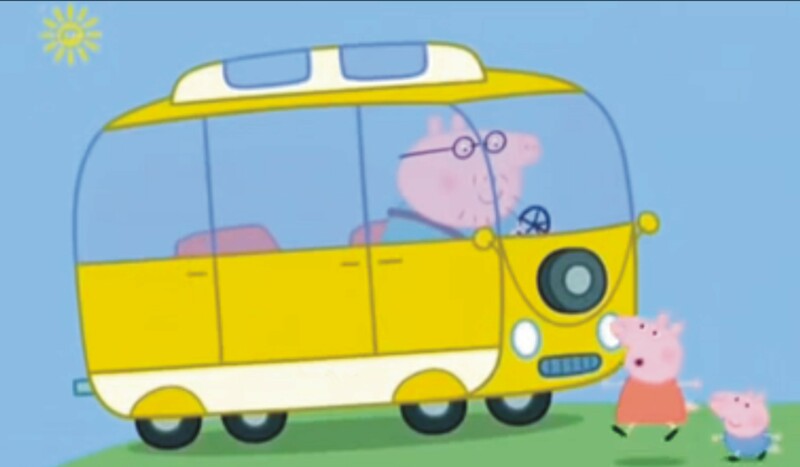 I had never heard of Peppa Pig before our little supergirl introduced me. Very cute british cartoon that explains the world clearly understandable for a two-year-old. 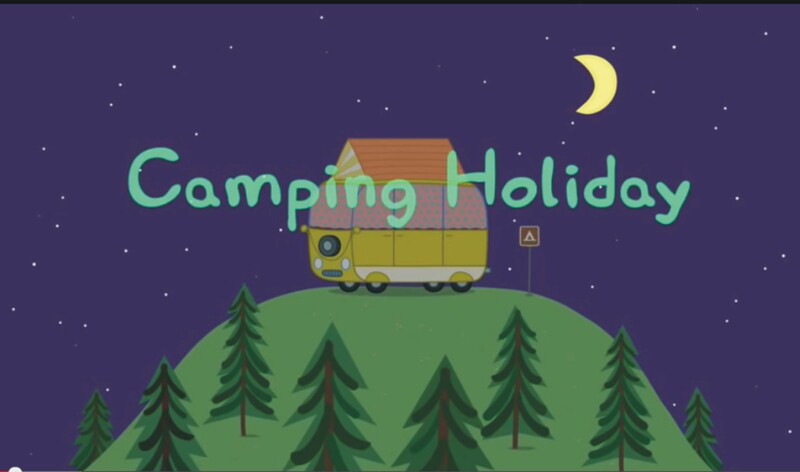 And there is even something in it for the kombi nerd – two episodes where Peppa and her family discover the joy of camping in a campervan. Which, only weakly disguised, turned out to be a Volkswagen bus. Girst I was a bit unsure but then the engine in the back clearly gave it away. The side ways-fold up roof would make it a dormobile campervan conversion. Below are some screenshots and the youtube links. Hope you like it as well! 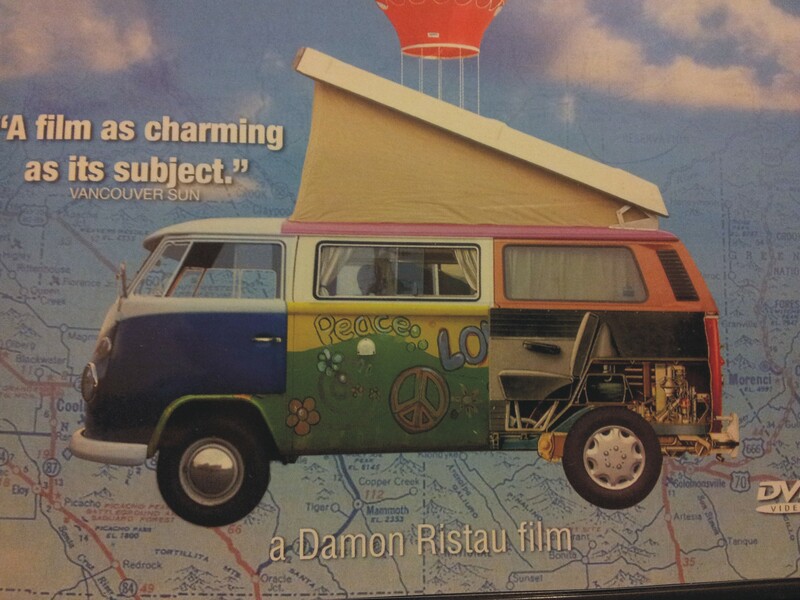 Best Motion Picture 2013 Staring: A Kombi Van! On Monday the movie Argo by Ben Affleck won the Oscar for best motion picture. Apparently loosely based on a true story, it describes how six US embassy staff were smuggled out of Teheran and rescued by the Canadian secret service and the CIA during the hostage crisis in 1980. 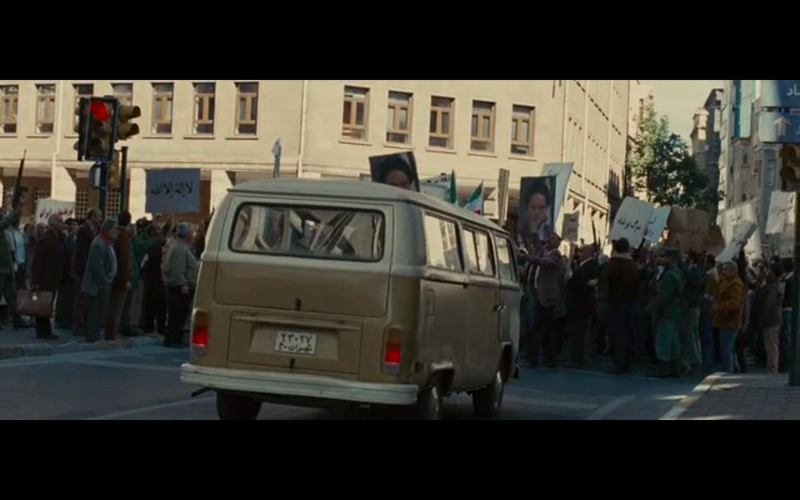 Seems like their cover was to shoot a movie and everyone was shuttled back and forth through Teheran in a – Tadah! – Volkswagen kombi. 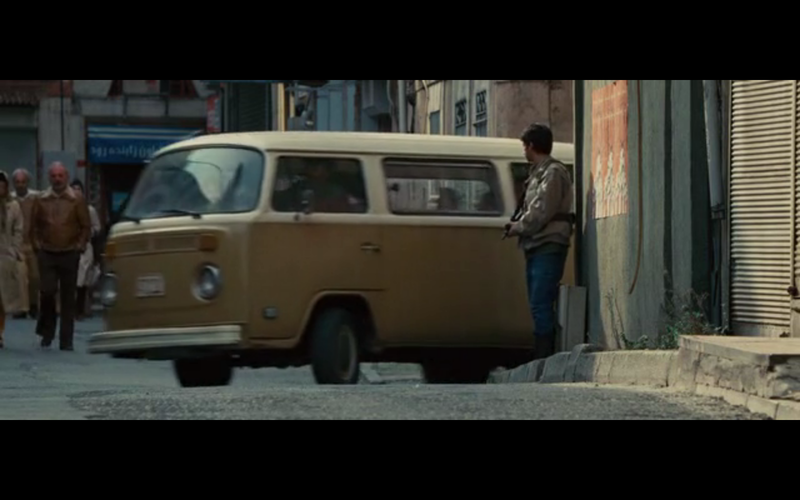 Looks like a sierra yellow and white US spec T2b microbus. Below are some snapshots from a senior member of my kombi scouting team (thanks!). PS: For the movie aficionados, here is the link to the wikipedia page for the movie: Interesting summary about the historical background, including detailed listings of the historical inaccuracies. Still it seems to be an exciting movie. 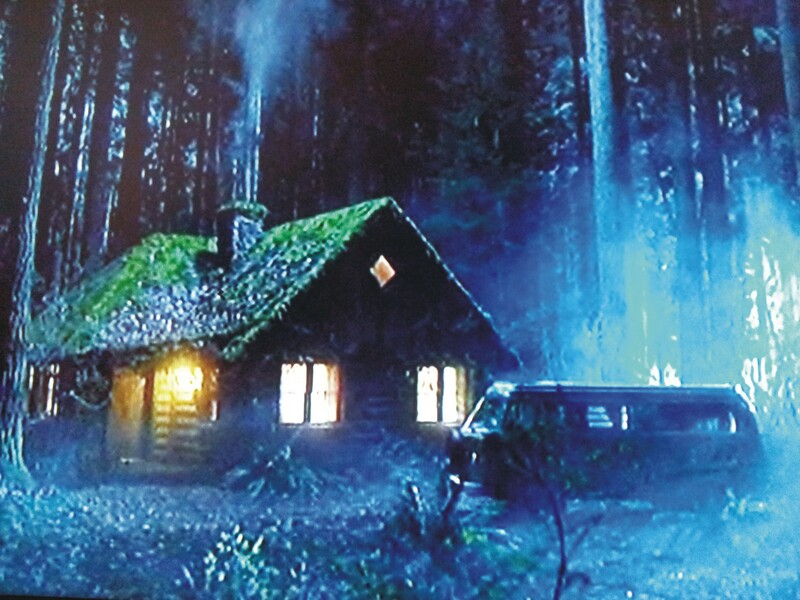 Today VOX aired the first episode of the Grimm series on German television: Looks like a modern take on the Grimm fairy tales and started with two episodes tonight, Little Red Riding Hood and Hansel and Gretel. The Big Bad Wolf was a friendly postman who occasionally turned into a werewolf and kidnapped little girls with red hoodies. Nick, the good guy and police man is “a Grimm”, a member of a family of monster hunters. There is also a converted good wolf, Monroe, who probably becomes Grimm’s friend later on. Nicely enough, both wolfs drive air-cooled Volkswagens: The good one a white beetle and the Bad Wolf what looked like a yellow and white Late Bay Westfalia campervan, with fold-up roof and spare tire on the front. I think I like this series already! „The Bus“ Movie Is Out! 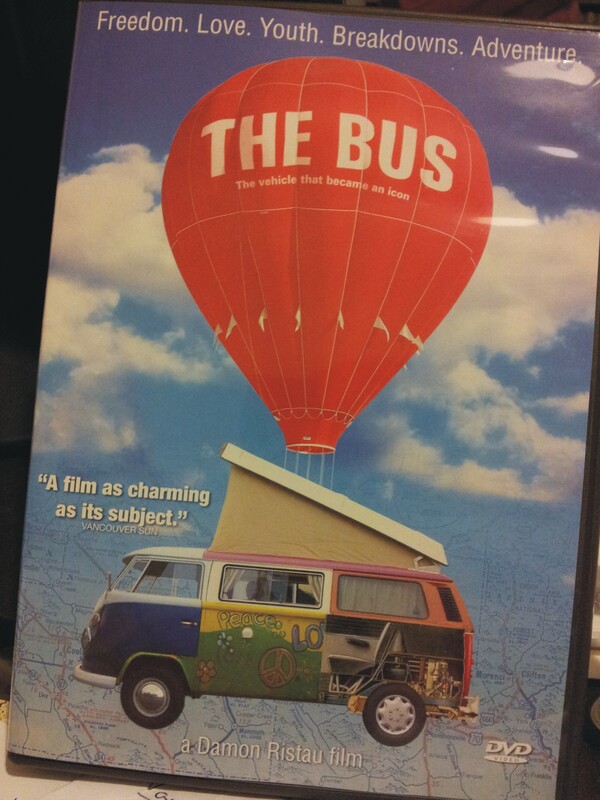 The documentary “The Bus” is finally out and you can buy it! I had ordered the DVD some weeks ago and it arrived a few days ago. Just watched it and really, really liked it. Beautifully catches the spirit of driving a Volkswagen bus. Makes you want to hop on the bus and start the next adventure. Hope we do that more often once our baby-daughter is big enough to make travelling a bit easier. And when she also can enjoy it more herself. Makes me also want to learn more about the mechanics so that I can do more on the car myself. 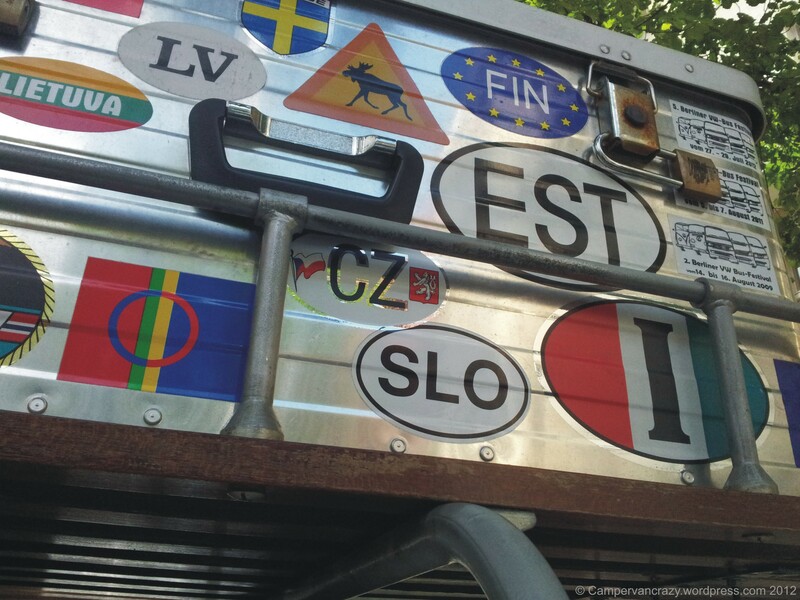 The DVD came with a BUS “country sticker” which went straight to the roof box today, together with the latest trophy, the sticker from the Czech republic. I also like the movie poster & DVD cover: T1, T2 and T3 morphed into one bus. 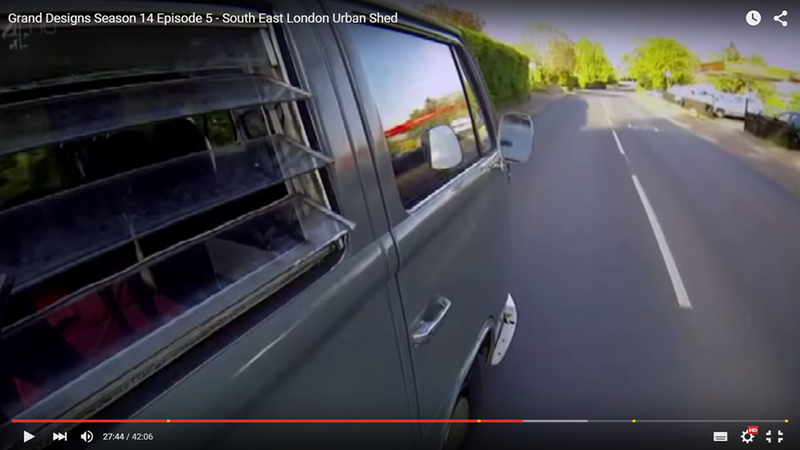 Many wonderful comments from the many people speaking about their lives with VW campervans. “You meet the best people when your car breaks down. The jerks won’t stop…” We actually helped two people with problems on the way to Czech. So bus drivers also seem to be the people to talk to when you look for help on a full Autobahn rest place. In fact we were the only people with a canister of petrol and could help that motorbike driver with a completely empty tank. Anyway, have a look at the movie trailers on their web page (or in my previous post). It is a beautiful movie. 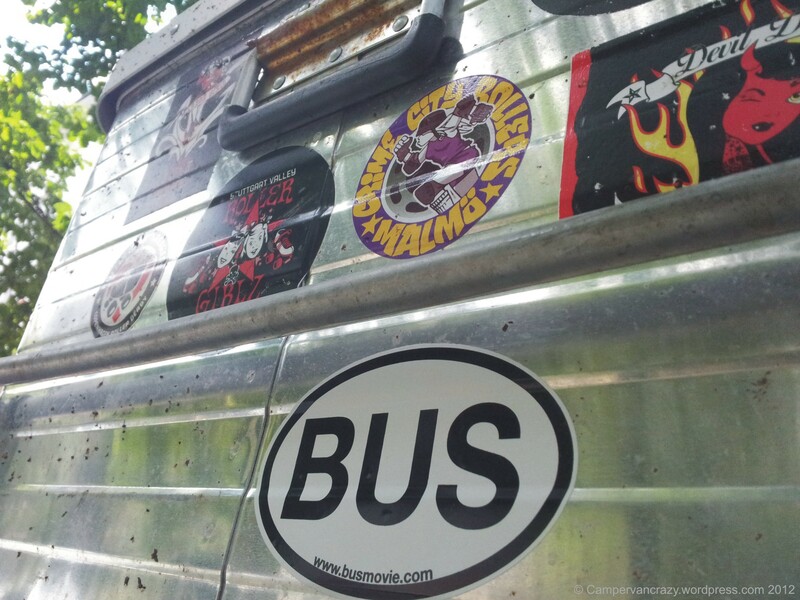 Trailer for “The Bus” – Awesome! Just found this movie trailer via a post on the VW Bus Facebook page. Awesome! Seems to be a tribute to the VW campervan – beautifully capturing what it is all about driving VW buses.